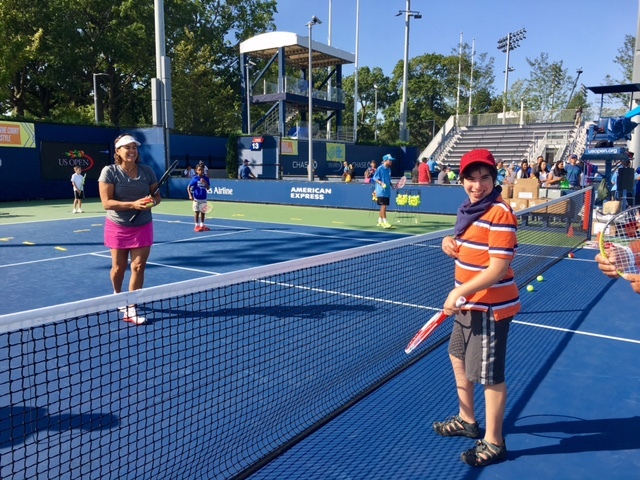 Last weekend, we headed to the US Open to enjoy Arthur Ashe Kids' Day. We had the kind of fun that Dave and I don't take for granted because years ago, it wasn't something we could have enjoyed as a family. 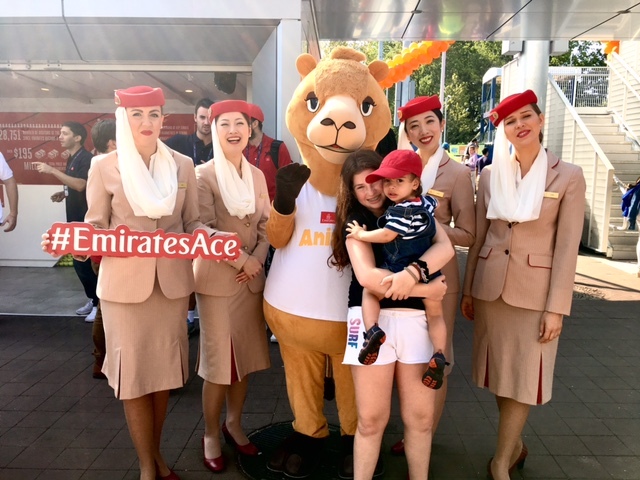 We were guests of Emirates Airline, sponsors of the US Open who just launched the #EmiratesAce social campaign (check this Facebook post for info on sharing about a person who's inspired you in life for a chance to win a trip to the Men's Final Match, plus other prize-winning opps). Throughout the day, you could watch pros practicing throughout. 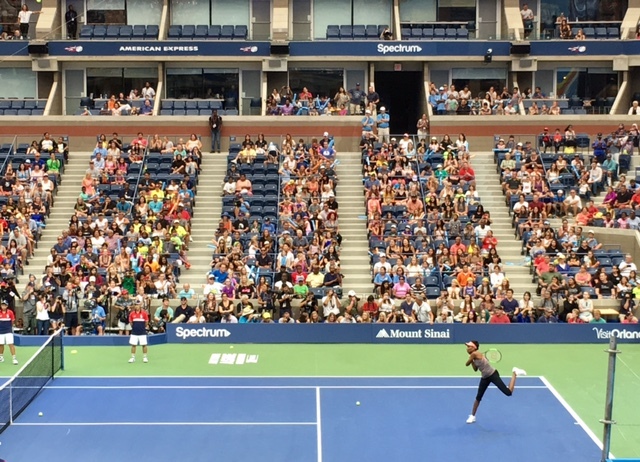 We got to see Roger Federer in action, including that magical shot he does from between his legs. Sabrina was duly awed. Max was eager to get to the tent where they were doing face painting; he'd decided to get "Las Vegas" on his face, in honor of his upcoming trip with Dave and his grandpa. And so it went. He told the woman doing the painting all about his trip. 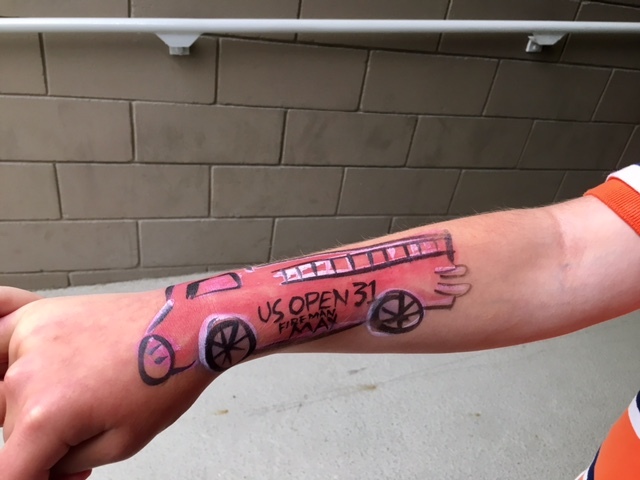 Then he also needed to have a fire truck painted on his arm with the number of his favorite, 31. 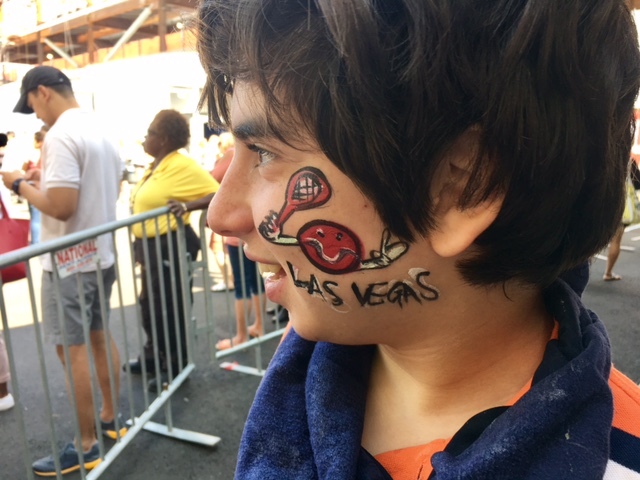 And yes, he was the only boy walking around Kids' Day with Las Vegas on his face and a fire truck on his arm. It was awesome. 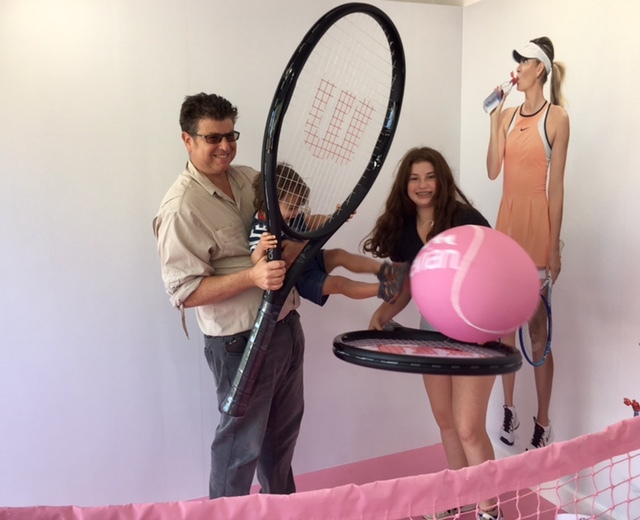 There was a Kids' Day show with live music, rising tennis stars and a pro play-off with Roger Federer, Serena Williams, Rafael Nadal and Angelique Kerber, which we watched from the Emirates suite. I'd never heard of the musical guests, including the band New Hope Club, which makes me officially old. 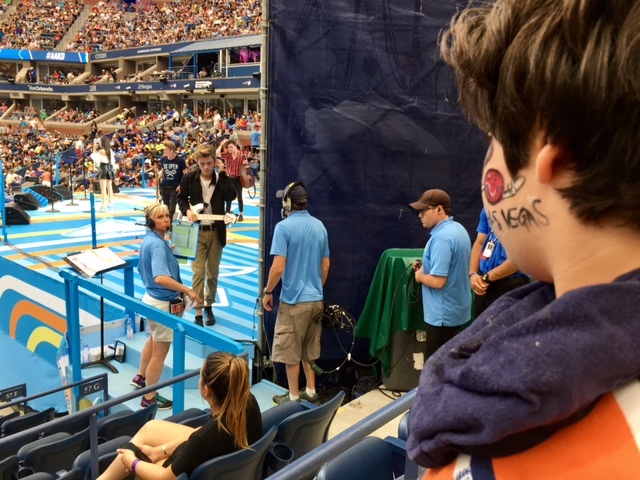 Max wandered out of the suite over to the backstage area, where we watched the musical acts come on and off stage. That's Reece Bibby exiting below, if that means anything to you. I've decided that Max definitely has boy band hair. 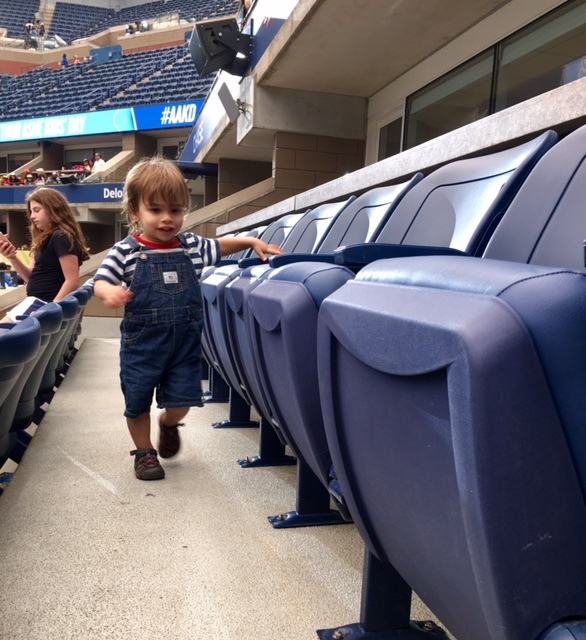 Ben, meanwhile, was thrilled to run up and down empty rows of seats, step up and down stairs and open and close doors. So a great time was had by all. There were many years in Max's early life where we were limited to places we could go because events and crowds unnerved him. It was such a catch-22; we wanted to expose him to as many experiences as possible to help expand his mind, but we were limited. That was then, this is now—but I think we'll never forget the "then." 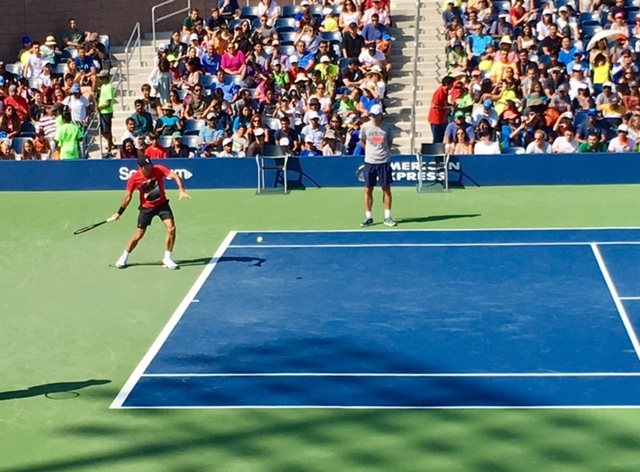 And so, when we have grand-slam slam outings like this, Dave and I are seriously grateful. Every child needs to feel empowered, but kids who have cancer and disabilities can sometimes use an extra dose of you-can-do-it. Enter commercial photographer Josh Rossi, 32, a father of two in Salt Lake City. He was used to making photo subjects look cool for his job. 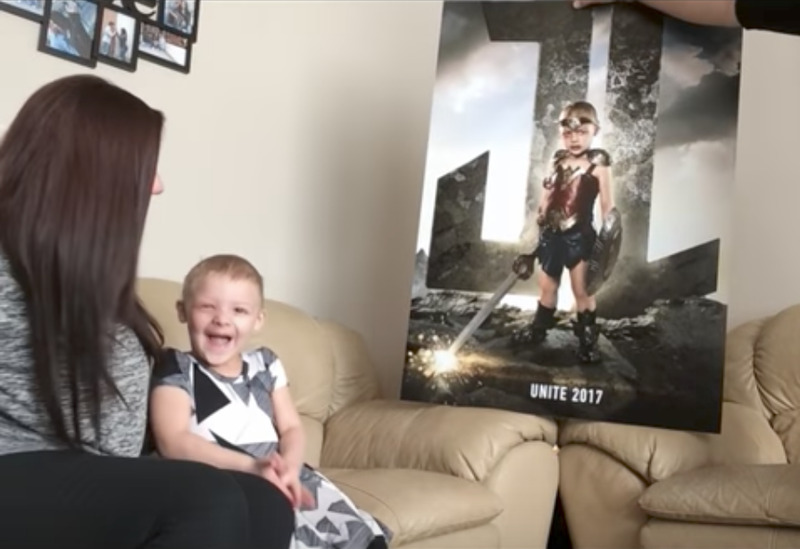 For Halloween last year, he dressed up his three-year-old as Wonder Woman, in the spirit of showing her that girls could do anything, and had her recreate scenes from the movie. The photos went viral, and he heard from parents of sick kids, asking if he could do something similar for their children. And so, he did. Josh invited six kids all under 8 years old, including ones with cancer and disabilities, to pose as Batman, Aquaman, Wonder Woman, Superman, Cyborg and Flash. Costume designer Julie Whitley worked her magic, and Rossi did a photo shoot one day last month. He recently posted the results on his website, dubbing the group The Justice League. Josh wanted to portray the kids' challenges as strengths. For instance, kryptonite weakens Superman's heart; Tegan Pettit, the kid dressed up as Superman, has half a heart and is waiting for a heart transplant. Zaiden Solrow, a boy with ADHD, is prone to running, and so Josh morphed him into Flash. Kayden Kinckle, a double amputee, became a cyborg. 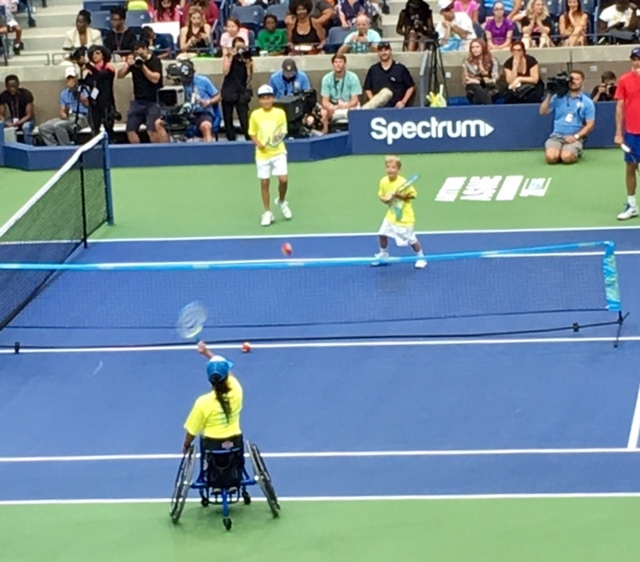 Now, I wouldn't call my child's disability a "weakness," a purely negative connotation. 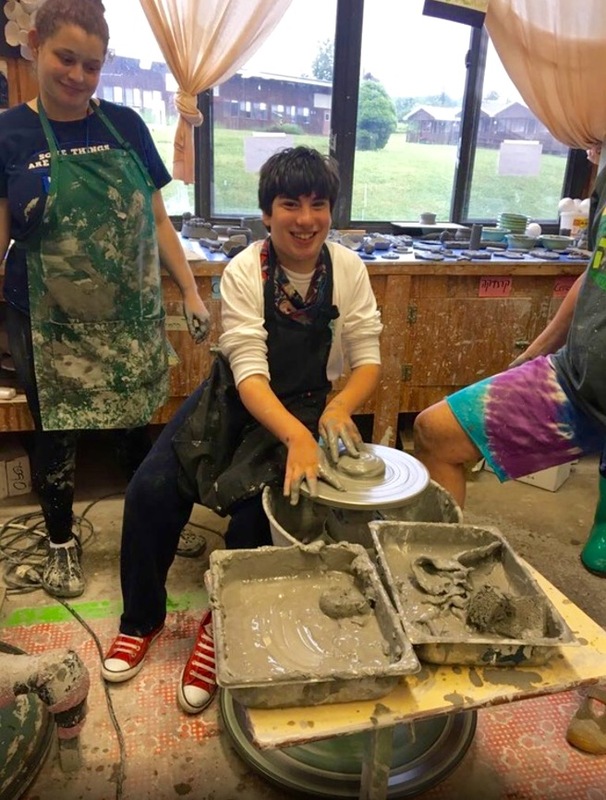 Max's cerebral palsy poses challenges for him, to be sure, but it is also an integral part of who he is. His CP is no more of a weakness than, say, a guy's bald head is. Again: Just part of the package. That said, it's great to see these kids' delight at being transformed into superheroes, ready to take on the world—and leap over naysayers in a single bound. Yesterday, Max had his double surgery. Last week, I got him a new lunch pack for high school. Both seemingly unrelated, yet both involved various degrees of worrying about Max. In the end, in the immortal words of FDR, the only thing I had to fear was fear itself...except for two things. Years ago, I used to worry that Max would someday require foot surgery to remedy tightness. It sounded painful and awful. 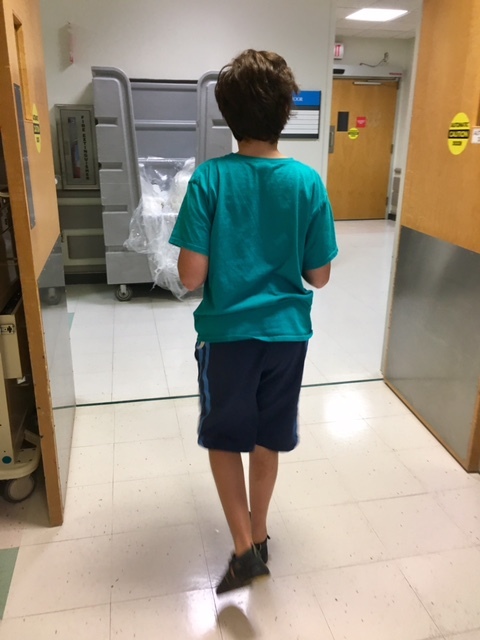 But when we visited an orthopedist this past spring and he noticed that Max's right foot was tight and turning inward and suggested a procedure, SPML, I was sanguine. I knew his foot needed help, and this doctor was THE doctor to do it. I was no longer that overly anxious mom so freaked about her baby's future. That's not to say I didn't freak at the hospital. Dave was coming over after our sitter arrived. As Max and I sat in the pre-surgery room at 6:15 a.m. and a nurse asked questions, I welled up. Max didn't notice; I'd put on videos of a Sailing Away party on a Disney Cruise, and he was mesmerized. I got ahold of myself, because the last thing Max needed was to see me upset. Max, meanwhile, had been telling everyone about his trip to Vegas and reminding them to call him Fireman Max. Then the orthopedist came in and made a pen mark on Max's leg where he was going to operate, and Max got nervous. I found a new video for him to watch. He didn't want to put on a hospital gown, which was fine. I did. We headed over to the operating room. The second Max walked in, he announced, "I'm not sick!" and got teary. I reassured him that everyone knew he wasn't sick. I reminded him that after the surgery, he would walk better and that he'd have less drool. We lifted him onto the gurney. The anesthesiologist showed him the anesthesia mask and said it was just like the kind firefighters use. Max kept shaking his head no and wouldn't put it on. I put the back of it against my mouth to show that it was OK. The doctor asked if Max wanted to hold it, and he grudgingly did. He took a whiff. "It smells good!" he said. A minute later, he was under. I left the room and started crying. It is awful to see your child unconscious. It is extra hard when your child's been in the NICU. Hospitals always take me back to that terrifying time in my life. I sat in the waiting room, a teary mess. I checked Facebook. Dave showed up. I did some work. I stared into space and worried. The first operation, for the drool reduction, was only supposed to take an hour. When that passed, I asked the front desk to find out how things were going. "The doctor's still operating!" I was told, aka no news is no news. An hour later the doctor, an ENT, walked into the waiting room. The surgery hadn't gone as smoothly as he thought it would. On the upside, one of the nerves that supplies the main salivary gland was easily accessible, not always the case. But: there was another nerve the doctor had to operate on and the right side of it was nowhere to be found. Seriously. It was possible that it had melded to the bone. The doctor had fiddled around. He wasn't sure he had gotten it, which could affect the outcome of the drool reduction. Also: there was a small puncture in Max's eardrum, which he had stitched up. (The doctor got to the nerves through Max's ears.) None of this would cause Max any additional discomfort. Overall, he was optimistic. I was disturbed. Nobody likes to hear their child's surgery wasn't perfect. Plus, if Max was going through this, of course I wanted the results to be ideal. We'll be bringing Max in for a follow-up next week. The other surgery went as well as it could, although we were surprised to learn that Max's foot was in a cast. I know other parents whose children had gotten the same procedure and they had been casted, but when I'd checked and double-checked with the surgery coordinator I was told no cast. A few minutes later, a staffer called us in to the recovery area. Max was awake and groggy, his eyes half open. He was also weepy, because he wanted to leave. We hung out while they checked his vitals. 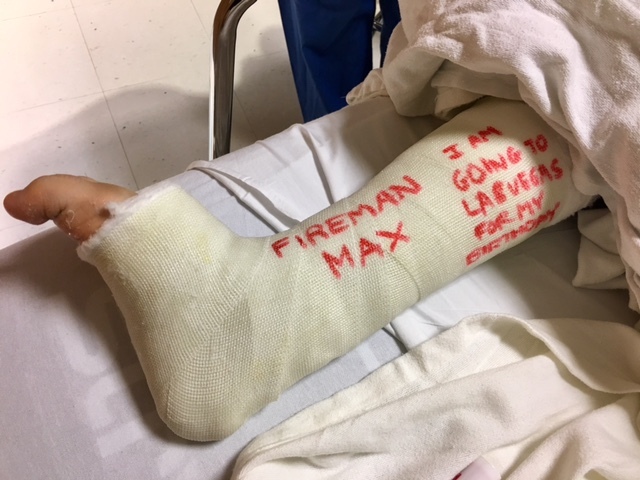 I asked for a red magic marker and wrote those magical words on his cast: "Fireman Max." He also wanted me to write "I am going to Las Vegas for my birthday." It took me back to six years ago when he'd gotten serial casting to straighten his foot, and I had to write "Max eats spaghetti sauce" (his obsession at the time). "It's not good!" Max said, pointing to his cast, and I pulled up old photos to remind him that he'd had casts on his feet before. Dave pointed out that roaming around Vegas would be easier, because the cast would help straighten his foot. That helped. Max was out of it for a few hours, then rebounded to his usual cheerful, chatty, pasta-loving self. He checked out the card Sabrina and Ben made for him. He downed a big bowl of baked ziti and gulped milk. He watched movies. He talked about what he'd do in Vegas. "I'm not sick!" he kept reminding me. Dave and I had to scramble to find a surgical shoe that fit over the cast—they'd only had a clunky boot at the hospital, which I thought would cramp Max's style. (Well, OK, I thought it would be awkward to walk around in.) We checked with a medical pharmacy, no luck. Sabrina saved the day by figuring out we should stop by a podiatrist. Max's foot will be achy and tender for several days, but he's on Advil and we have prescriptions for codeine and Valium in case of muscle spasms. Basically, he was fine and didn't complain of any discomfort. I was tempted to get the Valium for myself. As for the smaller concern that never came to pass, the other week I ordered Max a fire truck lunch pack from Pottery Barn Kids. I wanted to personalize it with "Fireman Max" (what else?) but they had a nine-space limit for names and "FireMax" wouldn't have cut it—he only likes to be known as Fireman Max. So I went with his initials, FMS, then worried that he wouldn't like it. I so wanted to give him something meaningful for the start of high school. The lunch pack arrived. I did not want to surprise him with it on the first day of school and risk a meltdown. "Max, I have a surprise—do you want to see it?" I asked. He did. I whipped out the lunch pack. He liked the fire truck pattern. Feeling nervous, I pointed out the initials. "No—Fireman Max!" he reminded me. "I told them that, but Fireman Max wouldn't fit—only your initials did," I said. And amazingly, that was that. He was content with initials. Another time when my worries added up to nothing. Meanwhile, my amorphous concerns about the drool reduction surgery had become a partial reality, but of course, of course, of course: the worrying accomplished nothing. Someday, some genius will come out with a "No Worries!" app and I'll be able to swipe my phone across my forehead and clear my brain. (Or who knows, maybe they'll be able to code apps directly into our brains.) I fret and ruminate a lot less than I used to when Max was younger, but still can't stop it. Such are the perils of parenting. Max slept on the couch in our living room last night. He couldn't bear weight on his foot, and he was too heavy to haul up the stairs. I hung out for a while to make sure he was OK. Suddenly, he picked his head up. "No drool," I reassured him. A few minutes later, his head popped up again. "It's 8:45!" he said, excitedly. That's the time his plane takes off for Las Vegas in December. And then my sweet boy drifted off and I sat there, in the dark, listening to the reassuring sound of his breathing and feeling glad the day was done. Yesterday, Max and I drove by an animal hospital while we were out doing errands. Max pointed to the word hospital. "Yes, tomorrow you're having surgery," I said. I explained that was a kind of hospital where they took care of sick animals. "Are baby animals born there?" Max asked, which made me smile. We talked a bit more about his upcoming surgery. "No more drool," he said, excitedly, gesturing toward his mouth. Max has been calm—even cheerful—about his double surgery. His main concern is whether he will be able to have mac 'n cheese for lunch. The recovery is supposed to be relatively benign. We had to get to the hospital at 5:30 a.m. to check in. Max kept saying, "It's night outside!" He was full of questions: Did he have surgery on his foot when he was little? No. Will he be able to walk afterward? Yes. Will he be able to walk during his December trip to Vegas? For sure! He told the staffer who admitted us all about it, and every nurse we've met too. The first surgery, for his right foot, starts around 7:30, followed by the procedure for drool reduction. 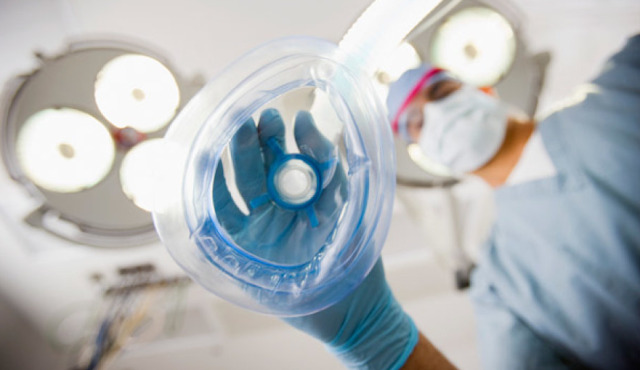 Anesthesia wigs me out, even though I know it is generally safe. Send good vibes for my boy, please. I'll update in the comments when I can. This post is being updated as more information becomes available. Two disabled people were among a group stranded on a rooftop in Houston; I watched their rescue on CNN late last night. Portlight, a nonprofit that facilitates projects for people with disabilities, reports hearing from people being turned away from shelters and denied sign language interpreters, "many of the same issues we've heard throughout past disasters," the site notes. There are not enough first responders. The usual infrastructure for emergency relief isn't functioning. 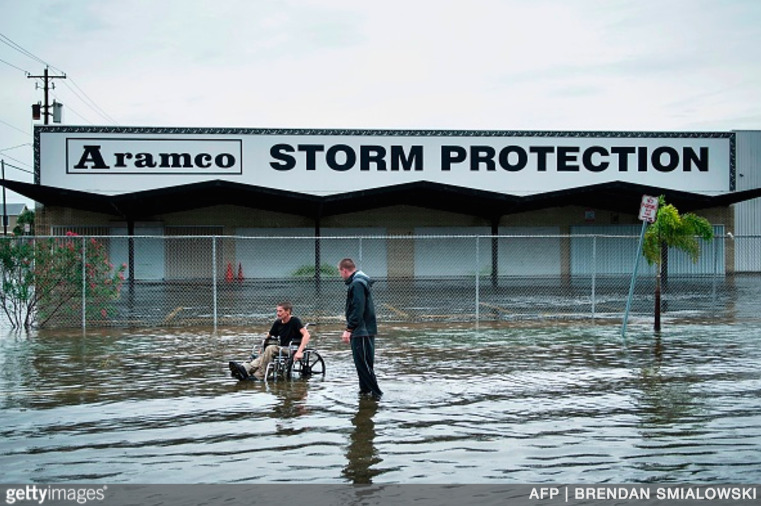 One man in Aransas Pass, the father of a 40-year-old man with disabilities, told The Denver Post that his son is on his town's list of residents who need help with evacuations; nobody came for him. The Partnership for Inclusive Disaster Strategies has a hotline at 800-626-4959 to help get people with disabilities and elderly people to safety, provide for immediate needs for durable medical equipment and other assistive technology, and problem-solve other disability accessibility issues. Find them on Facebook here. Its partner is Portlight, a longtime provider of relief to people with disabilities during disasters (they accept donations via PayPal). You can also drop off supplies in Texas and Louisiana, by appointment; see the website for more information, which is updated frequently. Or you can make a monetary contribution via PayPal to support@trachmommas.org. AAC Relief is helping individuals and family members who use Augmentative and Alternative Communication. You can request assistance here. You can also send supplies. Unlocking Autism is providing grants to families living with autism who have been impacted by Hurricane Harvey; priority is extended to families who are displaced. You can apply here. The nonprofit is accepting donations here. Insulin For Life, which partners with major organizations including the American Diabetes Association and the Juvenile Diabetes Research Foundation, is collecting diabetes-related supplies to distribute. 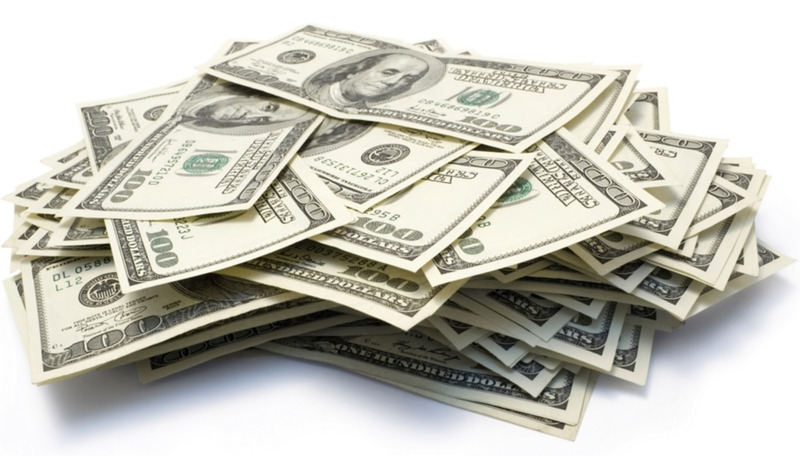 The nonprofit is also accepting donations to fund its work. The Texas Diaper Bank supports the needs of babies, children with disabilities and vulnerable senior citizens (diapers are often not available at emergency shelters). You can contribute to their Amazon Disaster Relief Diaper Wish List. Autism Rescue Angels provides funding for families having a hard time paying for care associated with emergency medical needs, among other ones. The nonprofit is accepting donations. A teacher in Texas has started an Adopt a Classroom program. Register through her form if you are a teacher in need of help—or you would like to send supplies. Although her form doesn't list the option of helping a classroom that has children with disabilities, you could specify that if you wish. Airbnb has a list of people who are opening their homes free to Texas residents in need between now and September 25; here's the page where people can find a place to stay, or you can offer yours. Check the Facebook page of Disability Rights Texas for other resources. The American Red Cross: Check their map of shelters to find housing, or call 1-800-733-2767. To donate: text "Harvey" to 90999 to make a $10 donation, give online or call 1-800-733-2767. If you can safely reach a shelter in Texas or can remotely interpret through video and wish to volunteer your time and skill to the Red Cross, text the Disability Integration Coordinator at 469-858-1574 or email jen.edwards2@redcross.org—again, email or text only. To donate to Catholic Charities USA: You can contribute here. Salvation Army USA: You can reach the Houston branch at 713-752-0677. To donate: Text "STORM: to 51555 to donate, contribute online or call 1-800-SAL-ARMY. Here is a relief map to find resources and aid, shelter and volunteer opportunities. Direct Relief: Runs the largest charitable medicine program in the U.S., providing prescription drugs and other medical supplies to clinics. You can make a contribution here. Americares also provides emergency medicine and supplies; you can donate here. Global Giving: Donate to to the Hurricane Harvey Relief Fund here. The Jewish Federations of North America: It's started a relief fund here. Save the Children: Text "hurricane" to 20222 to make a $25 donation, or give online here. Send Relief and Southern Baptist Disaster Relief: You can donate here. South Texas Blood and Tissue Center: For those living in the south Texas area, you can schedule a time to donate on the group's website, or call 210-731-5590. Here is a list of food banks that will need donations to fund them. One key lesson parenthood has taught me is that the squeaky wheel really does get oiled. My squeakiness has come into play when I've tried to score appointments with specialists who were booked months in advance, when I've attempted to get Max into programs, and when dealing with insurance companies. As any parent of a child with disabilities knows, sometimes the answer you receive from insurance reps depends on who you get on the line. This time, though, there was no room for error: we were juggling the costs of two surgeries, one to loosen up Max's foot, the other to reduce drool. Press "1" if you tend to need a glass of wine after dealing with your insurance company. The procedure for Max's foot is mostly not covered by insurance, as that doctor is out of network and there are in-network doctors who do it. That's the "cheaper" one of the surgeries. Last week, I was informed that based on a predetermination issued on June 21—the first we'd heard of it—just a small portion of the $12,000 drool reduction surgery would be covered by our insurance company. What?! That didn't make sense. The insurance company had already acknowledged that they couldn't locate another doctor in network who did the surgery. Why would we have to pay so much? Press "2" if your insurance company makes you want to commit hara-kiri. I emailed back and forth and back and forth with my so-called "customer service" contact, my final email asking upon what information the determination had been made. But then Dave stepped in, emailing them to note that there had been a mistake and affirming that since our doc is the only M.D. around doing this form of surgery, we shouldn't be responsible for paying for it. Press "3" if on average you spend more time per week communicating with insurance reps than with your spouse. Dave got the you've-won-the-insurance-lottery call on Tuesday from the supervisor of operations, and patched me in. In fact, they will be covering the surgery. We already had to pay the entire amount last week, given that the surgeon requires payments two weeks in advance and doesn't deal with insurance companies, so we'll be reimbursed. Yes, I'd like to know why the insurance company just figured this out a week before the surgery. Also: There's no reason we should feel like we've won anything when our family pays plenty for our insurance. We are entitled to all of the benefits. In the end, though, the big-bucks surgery is covered, and now I can settle down...and focus on freaking out about the anesthesia. Press "4" if you'd rather have a kidney removed than deal with your insurance company ever again. Press "5" to find out why the insurance company won't cover a kidney removal. She's volunteering for her brother's program. Squee! For years, Max has happily attended programs run by the Friendship Circle. 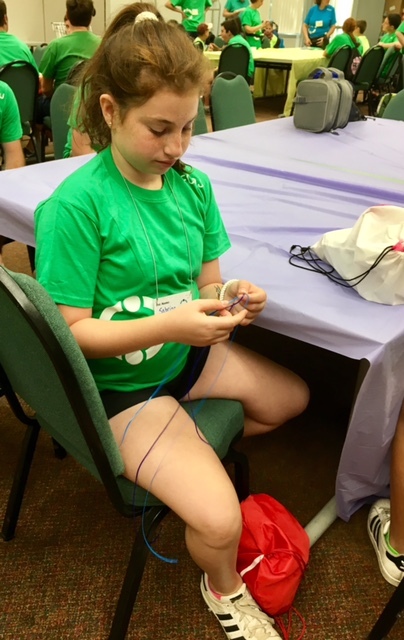 Last spring, Sabrina announced that she wanted to volunteer at their summer camp. It was seriously exciting. 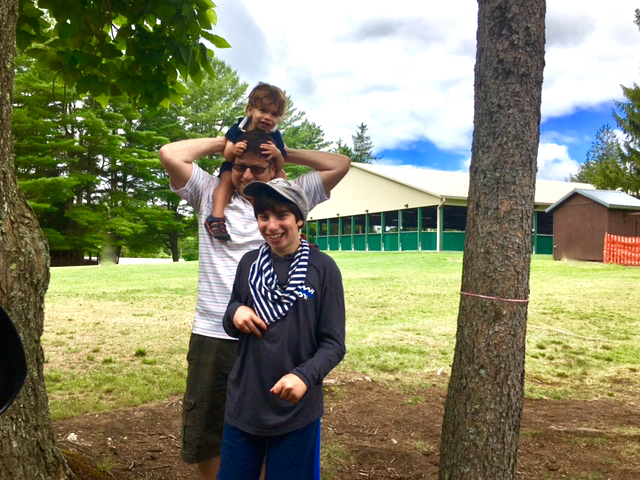 Since I've had Max, I've met countless teachers, therapists, and program staffers who decided to work with children with disabilities because they had a sibling or other family member with disabilities. One mom of two in my neighborhood became a speech therapist after her son had delays. I've always wondered if Max might influence Sabrina that way. In general, we don't put pressure on her to help Max. She naturally lends a hand here and there, but she and her big bro otherwise have a typical sibling relationship, fights and standoffs and all. She is fully aware that Max has plenty of abilities, and at times when he tries to get us to do stuff for him she's all, "Max! You can do that yourself!" There's no pity there, just your usual sibling drive for parity. When Sabrina said she wanted to pitch in at the FC camp, I gave her a high-five, and told her that was awesome and the kids would love her. What I was thinking: "Phew, we seem to have done something right raising you." Camp started Sunday and ends today. Sabrina ended up working in the siblings group, brothers and sisters of children in the main program. After I dropped off Max, I saw her making lanyard chains with a little girl and walked over to say hi. "You're so lucky—she knows how to do all the lanyard stitches!" I said to the girl. Sabrina shot me a look that said, "Please leave right now before you embarrass me any more, MOM!" I slunk away. Max, who is fond of making plans, has already put in a request to attend camp next summer. I told him he could. "Would you like to help at camp?" I asked. He's always been the beneficiary of these programs; I wondered if he might want to help the younger kids. Being a volunteer would be a great step toward independence, and likely confidence-boosting as well. "No!" he said. So he's not yet ready for that, but I think one of these years he will be. Meanwhile, Sabrina would like to keep volunteering for FC's year-round programs. So proud of this girl. Just don't tell her I said that, k? 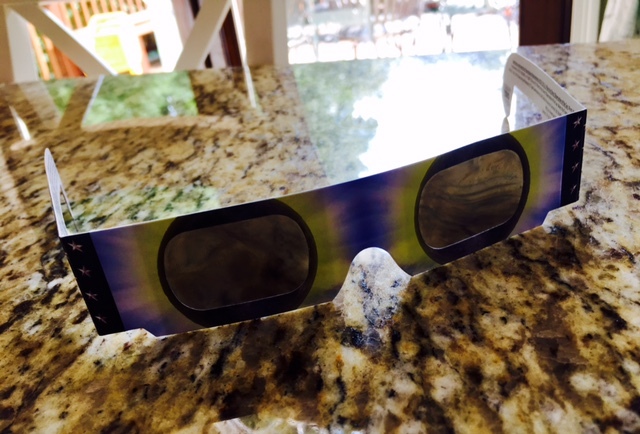 Days leading up to the eclipse: Consider buying eclipse viewing sunglasses, but get distracted by work, various back-to-school forms, figuring out how to entertain the kids before school starts, wondering when you'll pick up new clothes and shoes for them and the kajillion other things on your to-do list. Read Facebook posts about people traveling to cool places to view the eclipse and mull over the fact that you did not consider traveling anywhere to view the eclipse. Wonder if that means that parenthood has turned you into a wanderlust-less, boring human being. Stop wondering one minute later when your toddler is about to jump off the side of the couch. Day before the eclipse: See a flurry of Facebook requests from friends and neighbors looking for eclipse glasses. Briefly consider asking husband to track some down, but get distracted by trying to remove an unknown sticky substance from your kitchen floor. 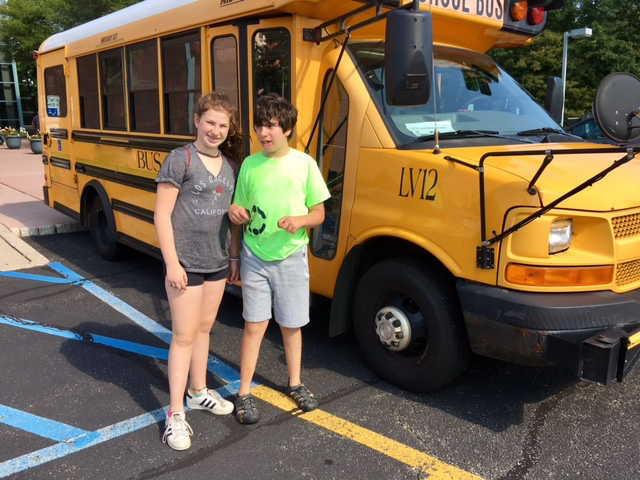 Day of eclipse: Older children head to day camp. Happily they're visiting an indoor theme park, so video games may rot their brains but the sun will not fry their eyes. Later in the day, attempt to watch live feeds of the eclipse but the screen is completely black. Realize your computer needs some sort of update, decide to look at photos instead. Whoa. EFOMO (Eclipse Fear of Missing Out) grips you. Are you and your family really going to skip the first eclipse in 99 years to sweep the entire country? No! First, though, you need to call and make some doctor appointments for the kids. And, wait, where is that school form you asked the pediatrician's office to fill out a few weeks ago? And come to think of it, what school supplies do the kids need, anyway? And WHY does the eclipse have to happen right before school starts? 11:48 a.m.: A friend messages you to say she bets Trump will look at the eclipse. Husband calls a few minutes later. He has decided he'll pick up the kids from camp then dash over to a local library for a viewing. Meanwhile, it's suddenly overcast outside. OMG. Is this it? Is. This. IT?! Check your local Facebook group. A woman says she has an extra pair of glasses. You text her. They're yours, for five bucks. Jump into your car, arrive at the address six minutes later, run up to the woman seated on her porch as if you are greeting a long-lost lover and grab the glasses. Wow oh wow oh wow. That is actually the moon partially covering the sun. The hype is real. Nobody steal this photo, it's being submitted for a Pulitzer. Continue to stand in front of the woman's home looking up. Call your husband, who has just picked up the kids, and inform him you have a pair of glasses and to head on home. 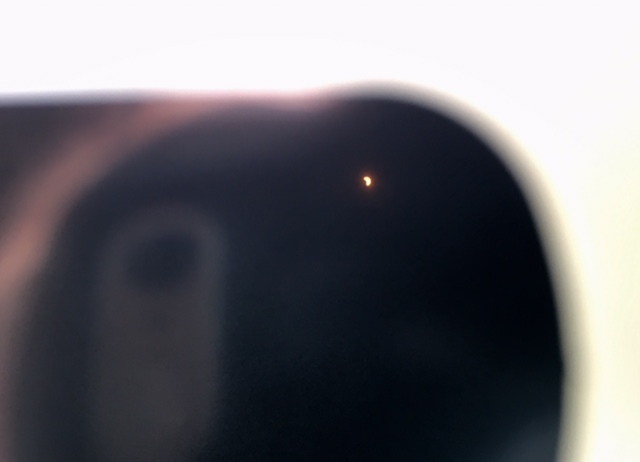 They arrive at 3:45, just in time to see a small sliver of moon still covering the sun. You have fulfilled your parent eclipse duty. 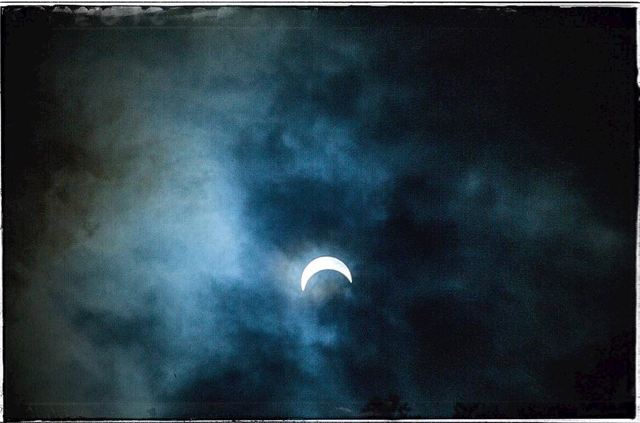 Later on, show them a photographer friend's incredible eclipse photo, to further alleviate your guilt that they almost missed the whole thang. As night falls, things look a little dimmer than usual in your house. Is it your imagination? Or did the glasses not do their job? Maybe your vision was affected? Will insurance cover it? Get distracted by the overflowing pile of laundry in the hamper, a sight you can't unsee. 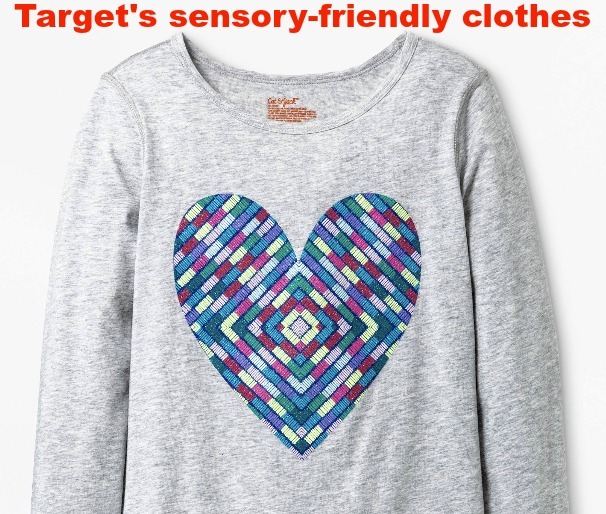 Last week, Target.com debuted sensory-friendly tees and leggings, part of its Cat & Jack line and a first for the brand. The pieces (size 2T-5T Toddler and XS-XL Big Kids) are tagless and have flat seams and one-dimensional graphics, to minimize discomfort from skin contact. There's also more ease through the hip and a higher rise in the leggings to accommodate diapers worn by older children. Target designer Stacey Monsen had personal motivation: she has a seven-year-old daughter with autism. The team also did research, meeting with parents and organizations. This fall, Cat & Jack will add adaptive pieces for children with disabilities—think zip-off sleeves and side openings, to make dressing easier. Obviously, it's a big deal when a behemoth brand like Target comes out with clothing for kids with sensory processing sensitivities and disabilities. Runway of Dreams' adaptive clothing collaboration with Tommy Hilfiger has also been leading the way. Hopefully, more companies and brands will follow suit, with options for teens and adults. And hopefully, someday I won't be writing posts like this because my boy will be able to browse any rack in any major store and find clothing he can put on by himself. "It means that my son can wear clothing that his friends wear! He won't have to miss a math lesson because of a tag.... It means a little freedom and normalcy. "—Tracy C.
"It means that I don't have to spend time 'fixing' clothes so that they are comfortable for my son! "—Lisa S.
"No more crying in the mornings. "—Tegan L.
"No inside out shirts. "—Kathie N.
"Need them for adults as well! "—Deb M.
"Their bigger pants for kids still in diapers means my kid might be able to wear pants that don't fall down on her tiny waist. "—Debbie S.
"Including seamless socks would help us get out the door a LOT more easily. "—Joanne M.
"Hopefully it means I won't be ripping tags out of my shirts, my oldest can get on the bus without a meltdown and that they will make some magical underwear that doesn't 'feel weird. '"—Cassandra L.
"No more scratching. Better yet, no more complaining and trying to rip the tag out! "—Adrianne B. 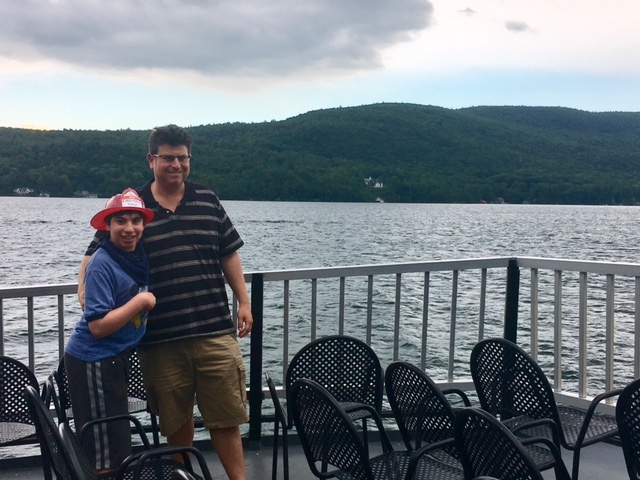 The Special Needs Blogger Weekend Link-up: Share a post! Heck, share two! Max's occupational therapist of more than five years left us last spring. She was pregnant and planning to take a break, and also feeling like she didn't have much more to offer Max. In the past year, she'd gotten into the MNRI method (Masgutova Neurosensorimotor Reflex Integration). She showed us how to do the exercises, and I bought the handbook; some are great for relaxing Max's muscles. The ultimate goal is to integrate certain reflexes that inhibit movement. She recommended we do a week-long MNRI conference when it came to our area. I was not convinced six hours of treatment a day for five days would have a lasting impact on Max, and neither was our neurologist. Also: It cost $6750. I knew another OT would have new tactics to try. The challenge was finding one who'd come to our home, because I work and can't hustle Max to therapies during weekdays. I put out a lot of feelers and got lucky—I found two new ones, and booked them both. The first, Liz, came over this week. A guy was in the basement fixing our furnace, which had leaked over the weekend and flooded part of our basement. As Liz stood in our kitchen he came upstairs and said, "I hate to tell you but your washing machine flooded." Sure enough, there was water all over the laundry area. Yep, two floods in two days, unrelated. So I was distracted while she was there, and not paying attention to what she and Max were up to on the deck. When she'd met Max weeks ago, she asked what I thought we should focus on and I told her life skills. Max's fingers often don't do what he'd like them to do, and he needs help with everything from pulling up his pants to brushing his teeth. "You want to do that stuff, right, Max?" I asked. He did not seem all that enthusiastic. He sometimes resists doing things himself because they are hard, and because he knows Dave and I will step in. At the end of the session, Liz and Max walked in as I was on the hold for getting a washing machine repair scheduled. "Max, do you think your mom can guess what we spoke about?" My first guess was Las Vegas, Max's December joy trip with Dave and his grandpa. "Max, tell your mom what we spoke about," she said. Max said a word I didn't understand. Liz presented a red piece of construction paper with a list, and I scanned it. Ah. He was saying "strong." As in, he wanted to get stronger so he could be a firefighter. The list is titled "Things Fireman Max wants to do by himself." They include: Getting dressed, from his undies on up; brushing teeth; cooking; using his right hand more; and getting stronger so he could climb a ladder as a firefighter. "This sounds great!" I said. "You need to do all of these things to be a firefighter. Because you want to live in the station, right?" Max's old therapist had gotten him to move around by reenacting fire scenarios. I loved how Liz was tapping into his firefighter aspirations to give him intrinsic motivation to work on life skills. As I know well, nothing happens with Max until he's ready to make it happen—and he wants to. Firefighter training happening at our house, soon. We inherited a swing set from friends this summer. 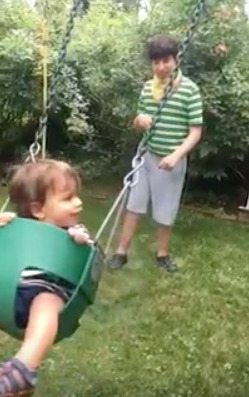 Ben loves the swing, and Max loves pushing him. It makes me really happy to watch the two of them together, and see their relationship blooming. Unlike some people, Ben sees Max for who he is. Max and Sabrina are always watching over Ben. "No, Ben!" Max informs him when Ben tries to use the couch as a jungle gym. "Benny! You're going to get your fingers stuck!" Sabrina says as Ben opens and shuts all the doors. "Benjamin! Eat the pasta!" Max cajoles him at mealtime. Ben doesn't yet see any difference between his older siblings, other than the fact that he's now able to point out who's a boy and who's a girl. Perhaps he never will. All Ben knows is that he's got a brother and sister who look after him, play with him, squeal when he does something cute and generally love him to pieces. As he grows up, Max will be that same person in his eyes: a brother who is there for him. He will likely have questions about his cerebral palsy, but he won't think of Max as special or treat him with kid gloves, as is true of Sabrina. (Hopefully, he will stop trying to bite Max when he gets on his nerves.) 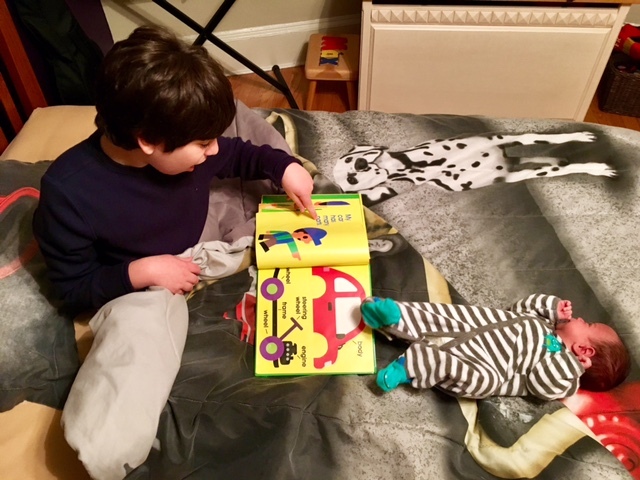 He won't think of Max as someone who can care for him "despite" the cerebral palsy—how it seems people sometimes view people with disabilities. Thinking that someone achieves things "despite" a disability unintentionally demonizes disability, making it out to be a nefarious force when, in fact, it is an organic part of a person. Having a disability is not all of my child, but one aspect of who he is. Too often, people can only see that one aspect. To be sure, Max has challenges to overcome. And it's true that as his mom, I don't take his accomplishments for granted, something instilled in me from the doom-and-gloom predictions at his birth. Still, the way I see Ben treating Max makes me wish that people treated Max more typically. Not someone who succeeds "despite" his disabilities, but someone who is the whole package of challenges, competence, abilities and potential, like any one of us. It's a good thing when your child's not thrilled to see you, right? Dave, Ben and I picked up Max from camp yesterday. The three of us had a nice few days at a resort in Pennsylvania, but by the time we were en route to get Max I couldn't wait to see him. That last five minutes on the gravel road to his camp took forever. "I hope you guys have a ton of tissues...." his program director had messaged me that morning. I'd already figured Max would be weepy, as he loves camp. We pulled up, the gate opened and we cruised to his bunk. He was waiting outside, with a bunch of counselors, looking remarkably calm. I grabbed Ben out of his car seat and started walking over. He glanced at me and Dave, then turned to talk to a counselor. I didn't have a parent existential crisis or anything but still: Not even a "Hello!" Last year when we picked him up, he ran to me and gave me a big hug. I decided it was a good thing that Max wasn't enthusiastic about seeing us, a sign of a great summer and independence. Or at least that's what I told myself. I gave him a big kiss. He wanted to know if he was coming back next year. I said yes. He lit up when I showed him the confirmation for plane tickets to Las Vegas, his upcoming joy trip with Dave. He got upset when informed it was for four days, not his fantasy of ten, but cheered up by the time we left. On the way home, we stopped at a cafe for French onion soup, a Max fave. We hit a Starbucks and he got some mood-enhancing whipped cream (yes, straight up). We chatted about what he'd done at camp, the friends he'd made, what he'd be doing in the upcoming weeks and starting school in September. I'd heard through the grapevine he didn't do his school worksheets because he was too busy socializing with a bunk of girls his age. He said that was true. I thought, awesome. Max giggled as he listened to Ben's new words: School bus! Big truck! Pool! Knee! Choo choo! Cookie! Mommydaddymommydaddy! New! More new! He squeaked a dinosaur when Ben got fussy and handed him the toys he dropped. He was duly impressed when I asked Ben to make a fire truck sound. He cracked up when Dave told him that next year, he'd be attending Peanut Butter Camp. (Max is highly allergic to the stuff). As is customary on trips, Max informed us we were going the wrong way as he thinks he knows better than the navigator. Sometimes, he does. Dave took Max out for sushi when we got home. I said goodbye from the back porch and Max said, "Mommy!" and threw open his arms for a hug. His shoulders almost came up to mine and suddenly, I knew for sure just how big my boy is getting. 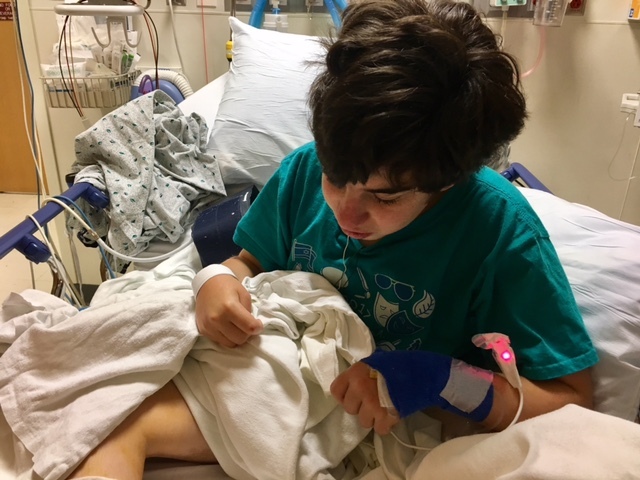 Years ago, when I first found out that some children with cerebral palsy undergo surgery to alleviate muscle tightness, I worried about whether Max would need it, as I worried about everything concerning his future. In a few weeks, it's happening, along with another surgery I hadn't imagined Max would ever get. For a while now, Max's left foot has been turning inward. He's mostly steady on his feet but occasionally trips, which can be particularly dangerous because his arms don't shoot out to cushion the fall. He gets tired when he walks any great distance. When you have the spastic form of cerebral palsy, as you grow muscles and tendons can shorten (called "contracture"), resulting in gait and mobility challenges. As a child's physique changes, the web of tissue that surrounds muscle and tendons, myofascia, can tighten up and become restrictive. When cut, the muscle beneath can stretch and lengthen for better agility. It's often done at the back of the ankle to alleviate calf and heel cord tightness. A couple of years ago, a parent had told me about an orthopedist, Roy Nuzzo in Summit, NJ, who specializes in Selective Percutaneous Myofascial Lengthening, SPML. 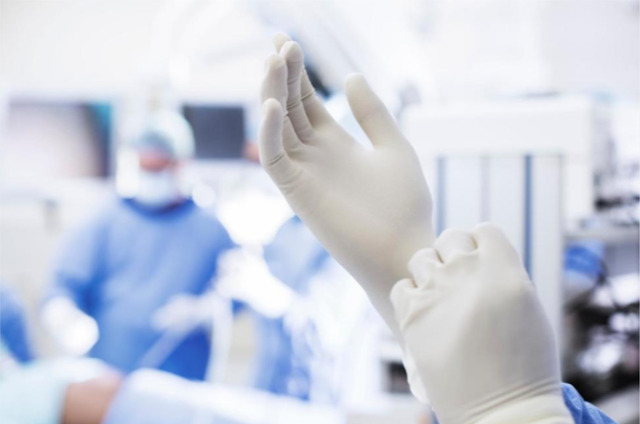 This form of lengthening, done under general anesthesia as an outpatient, involves micro-incisions. 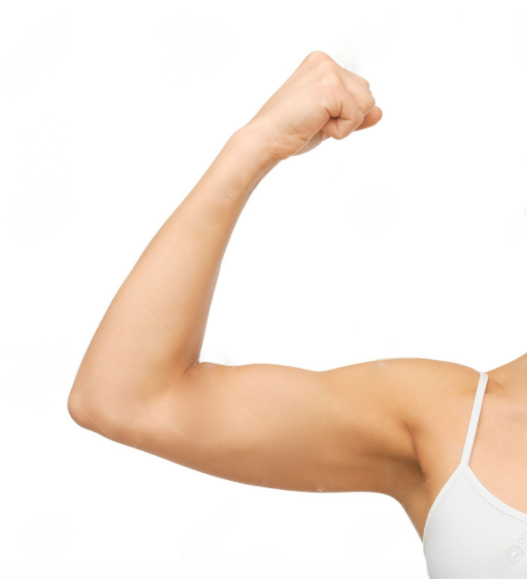 The benefit is that less scarring forms, a good thing since scar tissue can cause recurrent contracture. During our consult, Dr. Nuzzo asked if we wanted to also remedy Max's tendency to drool, given that he would already be going under general anesthesia. We have never succeeded in stopping it. The wetness makes his face chapped during winter and soaks through shirts when he does not wear a bandana. Botox injections to the salivary glands didn't do the trick (although I still think someone should open a Mommy and Me Botox clinic). Once, I took Max to see a doctor who reversed salivary glands so fluid would flow back into the mouth, but it seemed pretty extreme and I didn't want to subject Max to it. A couple of times, I got a prescription from Max's neuro for the scopolamine patch, which is used to treat sea sickness and is also effective for drying up the mouth. The boxes of patches sat in a cabinet in our kitchen, unused until they expired. I couldn't bring myself to medicate Max if it wasn't critical and, just as importantly, he himself didn't ask to remedy it. Last February, we had a conversation about it after he made a comment. And then, a few months later, he point blank said to me, "I don't want to drool." I am not sure what triggered that, but as he's getting older he's become more aware of his body. 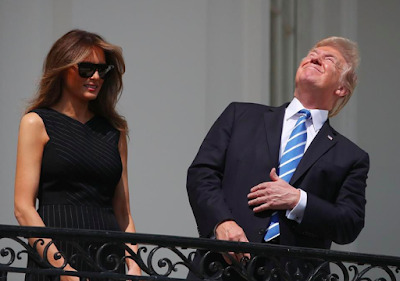 While he did not specifically say he doesn't like it when people stare, and I wasn't going to point that out, I wondered if it was part of it. Dr. Nuzzo told us about an ENT, Stephen F. Freifeld in Springfield, NJ, who does a surgery for drooling called tympanic neurectomy that involves going through the ear canal and dissecting the tympanic nerve, a supplier for a major salivary gland. We did a consult and while Max was on the older end of youth he'd treated, he thought we could get good results. (He wasn't sure why younger kids had better improvement in drool control.) There would be minor discomfort for a couple of days; recovery is typically quick. The downsides: mouth dryness, As with the patches, the resulting downsides could be dryness of mouth and a ruptured ear drum. The doctor noted both were rare among the two hundred plus patients he'd operated on. 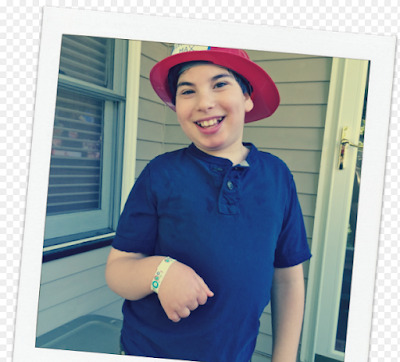 Although studies of children with spastic cerebral palsy who'd had SPML were small, including this one that examined 58 kids, they found no complications and improvement. Several parents I connected said their children had excellent results from Dr. Nuzzo's surgery. The studies done on tympanic neurectomy were even smaller and pretty old, but positive. I looked up both doctors on the Federation of State Medical Boards, and no actions had been lodged against them. I double-checked their credentials on the New Jersey Division of Consumer Affair to see if they'd had any malpractice suits, disciplinary actions in state or out or other issues. Both got a clean bill of health. Max's neurologist and pediatrician gave their OK. I also did due diligence with Max. I explained that he'd go to a hospital and doctors would do an operation to help his foot and his drooling. I reminded him how he used to get Botox injections when he was younger at a hospital, and that he'd be asleep when they did them and wouldn't feel them. I showed him the expired box of patches that he could choose to wear behind an ear instead of one of the surgeries. Did he want to get the surgeries? He said yes. Still, the benefits of these surgeries seemingly outweigh the negatives: Max will have a lower risk of an injurious fall, why we'd rather do the SPML sooner rather than later (and he is getting too old for the other surgery). Both surgeries are less complex and involved than others of their kind. There isn't significant discomfort or recovery time. By having two of them at once, Max will avoid undergoing another round of anesthesia. His drooling will be less of a nuisance to him, and less of a social impediment. All in all, Dave and I believe these surgeries will improve Max's well-being, quality of life and comfort. As always, we hope we're doing right by him..and we hope for the best. If I had to choose between coffee chains, I'm Team Dunkin'. Dave is Team Starbucks, so he's psyched, but I find their coffee bitter. While I like Fraps, my waistline sure doesn't. My favorite is their shaken iced tea (Passion Tango), and when cravings strike it's easy enough to grab one from the town a mile away. I get my iced coffee (Jamaica Me Crazy) from the coffee shop in town I've frequented for the 15 years that we've lived here. Some Facebook commenters worried that it, along with the coffee-serving bakery shops, will suffer from lost customers. I love our town's core shopping district, with its mix of independent stores. It's charming and old-school awesome. I enjoy buying gifts at the toy store, where the owner, Erin, always has cool recommendations, and browsing in the bookstore with the kids. We have no McFood places because of an ordinance restricting fast-food chains; town officials said Starbucks isn't one, but perhaps they were buzzed from their double-shot ventis. Other commenters pointed out the positives, like new jobs—one woman posted that she was going to be working 20 hours a week, with good benefits and plenty of time to spend with her girls. Someone noted that towns need to modernize, and that when ours first got a nail salon there was an uproar. This Starbucks will stay open till 10:00, unlike the coffee shop that closes around 7. And because it won't serve a full menu of food, people don't believe the coffee shop will be affected. One person hoped this was one of the Starbucks that serves wine and beer. But: no. In the end, I don't think we're on the verge of a coffeepocalpyse. 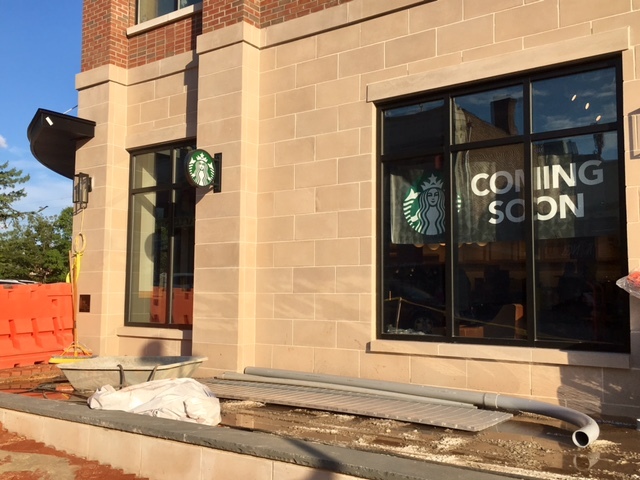 The Starbucks could attract more visitors to town, who might then shop at other stores. Not for nothing, people looking to move to our town are more likely to be excited than alarmed by its presence. Those like me who already have their preferred fix for caffeine will likely stay loyal, and the Starbucks crowd can have their Frap and drink it, too. Max took his "Fireman Max" hat to camp. "Max, do you really want to wear that?" Dave asked. It was a rhetoric question, because Dave and I both knew what Max's response would be: "Yes!" Max is wearing it in practically every photo I've seen of him at camp. And then, it was just part of him. I never gave it a second thought, except if we were out and I noticed kids staring and adults smiling. 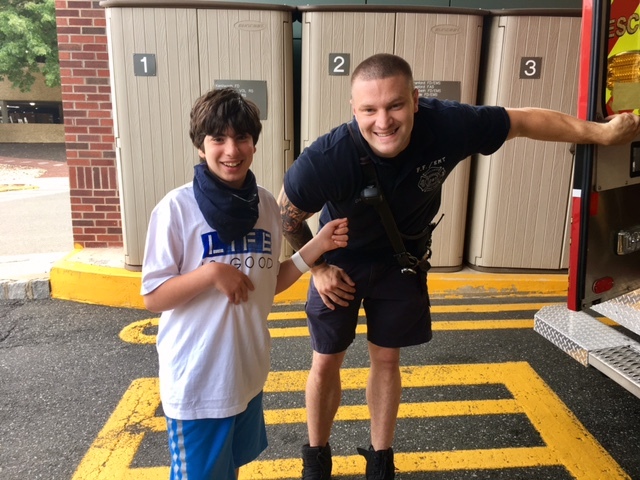 It's been an incredible conversation piece, because we've regularly met people with relatives who are firefighters and who like to discuss them and Max's firefighter aspirations. Max is now 14. And Dave's had concerns about the firefighter hat making him look immature. 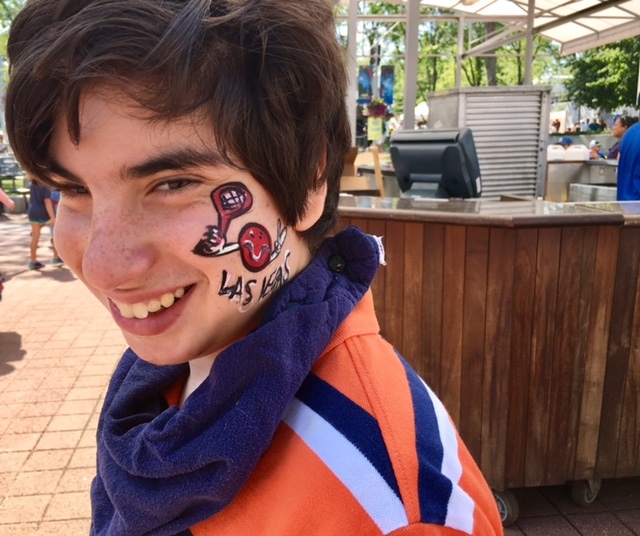 I get where he's coming from: We'd both like Max to connect with peers of all kinds, including ones without disabilities. When Max was 8 and deep in the throes of his purple phase, I wrote about not buying him a pair of purple sandals at Target because I wanted him to better fit in. And now, the firefighter hat. He's mostly stopped wearing it (sometimes, he likes to wear a cap our local fire department gave to him), but he wanted to take it to camp. It's how he IDs. He is Fireman Max, and he wanted to make sure his fellow campers knew. I was cool with that. Dave had mixed feelings. The other day, a friend posted a pic on Facebook of a tee in Target's men department that she wanted to get her teen son, who has Down syndrome and autism. The shirt had a picture of Belle holding a book with the caption, "My weekend is all booked." This has particular relevance to her son, because Peg excels at making fun plans for him, and he loves all things Disney. For a split sec, she wondered if a boy should wear Belle. It was her oldest daughter who nailed it, noting that her brother wasn't raised with any notions of what's "male" and what's "female." As she noted, "He does what he likes without any bias. It's the way we all should be." Another mom piped up, "If something makes you happy, screw whatever preconceived notions are out there!" As I read the comments, it occurred to me that if Sabrina wanted to wear some out-of-the-box accessory, we'd let her. Max deserves the same. He doesn't care what other people think; why should we? He will relate to his peers in whatever way he chooses to. I talked about it with Dave over dinner last night. He knew, of course, that the hat makes Max happy. He grudgingly agreed we couldn't control it. Firefighter hat for the win. 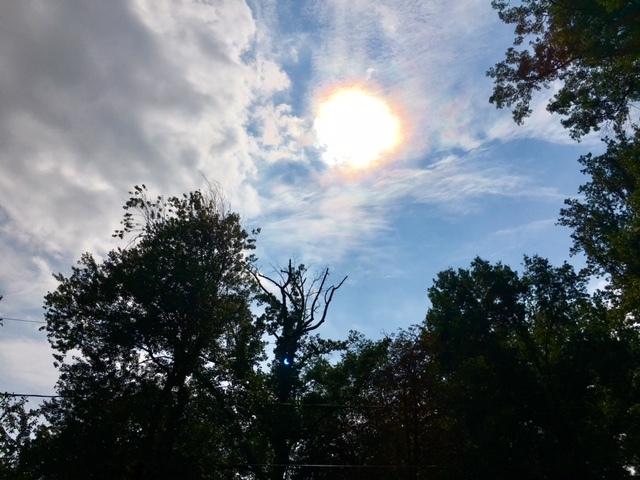 The Disability Blogger Weekend Link-up: Attention, please! 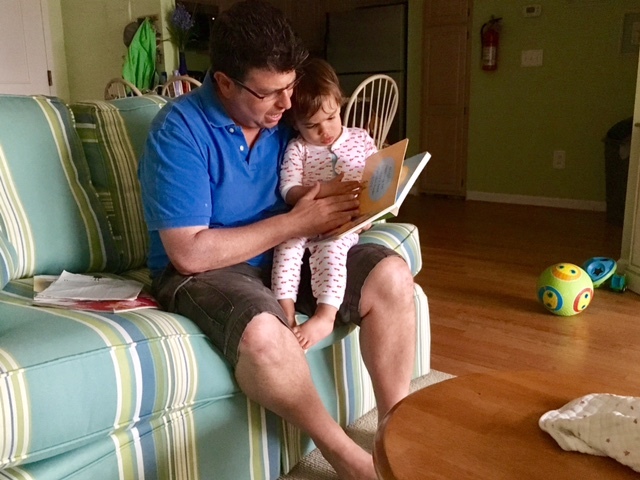 Passing along my love of reading to my children has been one of the greatest pleasures of parenthood, other than having to read Goodnight Moon every evening for the past two months to Ben. Over the years, I've found ways to encourage engagement: Read in silly voices, ask the kids questions about the book and pictures, read a new book then have them guess the title. And now, I've picked up some new tactics for comprehension, thanks to this post created by education.com and adapted for the blog. When Dolly Parton started the Imagination Library program, she wanted kids in her home county of East Tennessee to feel the magic that books can create. That magic comes from reading with imagination. Indeed, reading is powered by imagination. It's an active process that generates vivid and stimulating experiences. These are some ways to help children better comprehend what you read together, harnessing the power of their imagination. 1. Play: Guess What Happens Next? Anticipation brings out the drama of a story. Stop at an interesting point in the book and ask your child how they think the story might develop. Encourage multiple predictions! The more goofy, improbable and fantastic they are, the more they get the creative juices flowing. When you resume reading and learn the plot, discuss the various predictions. When you come across figurative language, spend time on the literal image. For example, discuss how two peas in a pod look. Search Google Images or grab a pea pod from the fridge and open it, then together make observations about what two peas in a pod are like. 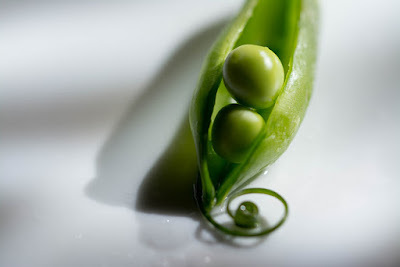 Connect your discussion to the figurative meaning in the story, noting if there are other places that are about two peas in a pod. Using crayons or markers, draw two different scenes in the story, two different characters or two different objects. The pictures can be as detailed as your child wants to make them, and he or she can add elements of their own. Discuss the drawings. Teachers frequently stop and ask, "What in the story caused this to happen?" when they're teaching reading, to enable students to understand cause and effect. Try a question that can be even more thought provoking: "Is it possible what happened could have happened in a different way?" Your child can come up with changes to the story, exploring multiples causes and their effects. Many children's books have morals to them. Let's say the purpose of the book you're reading with your child is to show that friendship matters more than money. Talk about that with your child, then expand that moral. For example, maybe it's that friendship and having a good time matter more than money. Talk about how the story would be different if you added that twist. Discussions like these expand children's reading comprehension, and make reading more fun, too.